Accessible and engaging, this unique text offers concrete, practice strategies for critical and creative thinking and includes many opportunities for practicing these fundamental skills. 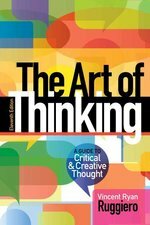 The Art of Thinking introduces students to the principles and techniques of critical thinking, taking them step-by-step through the problem-solving process. Emphasizing creative and active thought processes, the author asserts that good thinking and problem-solving is based on learnable strategies. The book's four parts, "Be Aware," "Be Creative," "Be Critical," and "Communicate Your Ideas," present students with a process for solving problems and resolving controversial issues. Discussions of how to evaluate ideas and how to question long-held assumptions or biases help students look at concepts critically. This text can be used in freshman experience courses, freshman composition courses, and a wide array of other courses where instructors want to enhance students' critical thinking skills. A core reference for mechanics, aircraft owners, and pilots, this book compiles specifications from numerous reference books and government publications into one handy, toolbox-size reference guide. Revised to reflect current specifications, it provides mechanics with all the reference information critical to maintaining aircraft, including the most frequently used measurements, scales, charts, and diagrams. Topics covered in detail include metal fabrication, corrosion control, nondestructive inspection, control systems, and oxygen-system servicing. This new edition features additional information on the latest techniques in the industry, including composite materials and aircraft batteries. The stay-flat spiral binding and tabbed format facilitate quick look-ups and make this a convenient and safe on-the-job reference book.